In addition to the 4 C's, there are numerous other factors that can be used to determine the quality of a diamond. Of particular interest is Fluorescence, Polish & Symmetry. Many diamonds have a natural Fluorescence which is visible under ultraviolet light. The intensity of the Fluorescence is categorized as Very Strong, Strong, Medium, Faint or None. Generally speaking, a rating of Faint or None will have zero effect on the price of a diamond. For diamonds between D & H in the Color range, which are nearly colorless, a Medium to Very Strong Fluorescence can adversely affect the price anywhere from 5% to 15%. The reasoning for this discount is because the blue hue emitted by the diamond will take away from the clear, colorless aspect. It is important to remember that this is only under ultraviolet light, as the glow would not be visible under normal circumstances. 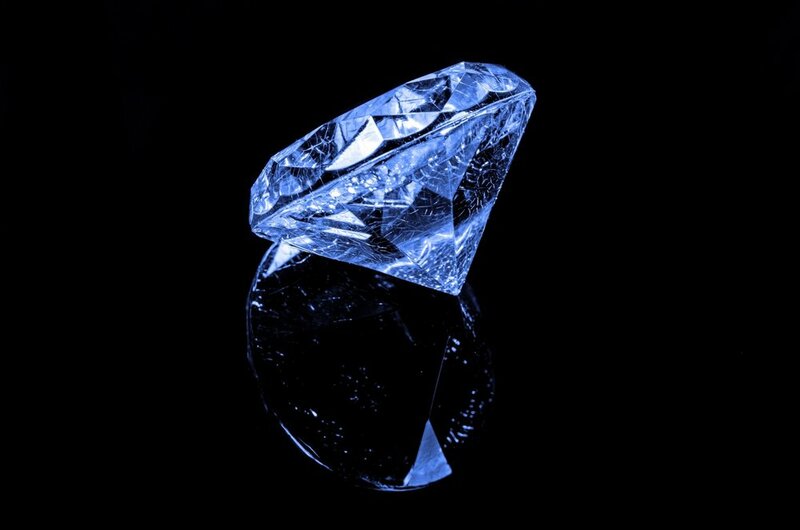 As such, a 5%-15% discount can be seen as a buying opportunity when pricing a diamond with Medium or Strong Fluorescence. Interestingly, for diamonds in the higher color ranges of I-M, a Very Strong Fluorescence can produce a slight price increase. This is the result of the blue hue of the Fluorescence cancelling out some of the natural yellowing Color, making the diamond appear more colorless. Polish refers to the degree of smoothness for each surface of a diamond. The polishing process, by its very nature, consists of removing micro-amounts of materials from the surface of the diamond in order to make it perfectly smooth. As such, the diamond can result in either having a less than smooth surface, or having additional defects mar the surface as material is removed. Polish is determined by viewing the diamond under 10X magnification. It can range from Excellent, showing no defects, to Poor, where defects are visible to the naked eye. Typically, any Polish rating of either Excellent, Very Good or Good will have defects invisible to the naked eye and have little to no effect on pricing. Ratings below Good should be avoided. Diamond Symmetry refers to how exact each of the diamond’s facets are in relationship with each other, as well as the accuracy of the Table, Cutlet & Girdles. Like most factors, a diamond’s Symmetry ranges from Excellent to Poor. In an ideal world all diamonds would exhibit Excellent Symmetry, but many times the cutter will adjust the shape of facets slightly, the size of the cutlet, or the orientation of the Table as a means of removing defects that are inherent to the stone. Symmetry ratings from Excellent to Good will show little to no defects under 10X magnification. As such, it should have virtually no effect on pricing. Any diamond with either Fair or Poor Symmetry should be avoided. While diamonds with a Good rating and above would be impossible to differentiate with the naked eye, many times a 5%-15% price premium can be found for diamonds with Excellent Symmetry. This is another area that can present a buyer with an opportunity for value-based savings.